Chambers & Company have been the lead lawyers on two out of the only three successful major operating iron ore joint ventures with China in Australia. We were the lead lawyers on China’s first overseas project, the AUD420 million Channar Joint Venture with Hamersley Iron when we acted for the Ministry of Metallurgical Industry (now Sinosteel). We were also the lead lawyers on the Wheelarra Joint Venture between BHP Billiton and four of China’s largest steel mills. The combined contracts for these two projects exceed AUD30 billion. Our law firm was awarded the Energy and Resources Deal of the Year Award by the Australasian Legal Business Magazine for our role in the BHP Billiton project. 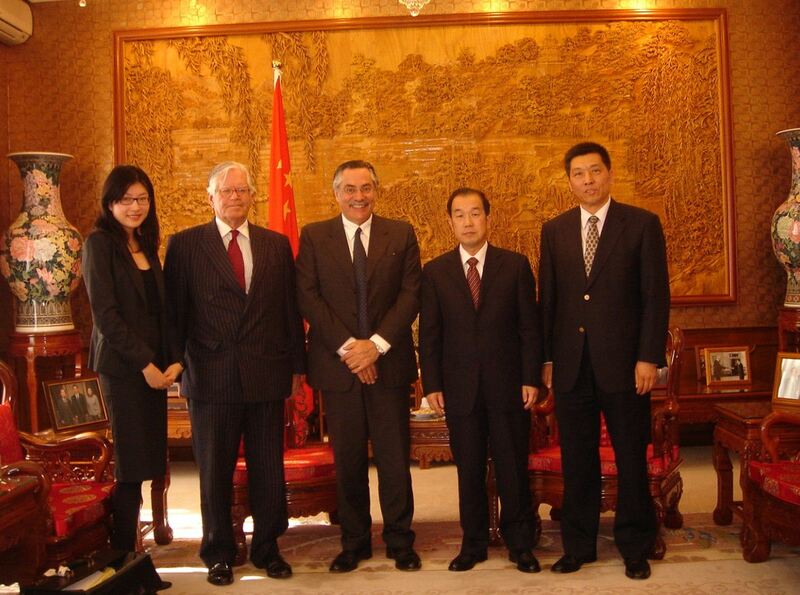 Our firm has been involved in China since 1984 and our senior partner, Mr Robin H Chambers AO has travelled to China more than 200 times over that period. We have unique expertise on China-Australia projects having facilitated numerous successful investments in projects for Chinese clients in China and Australia. ­­Our firm’s competitive experience on iron ore projects in Australia stems from our lawyers collectively having special experience on major projects with China which is very competitive with other law firms in Australia. For these projects, we have advised on the negotiation and documentation process to convert proposed investments and off-take purchases from initial Letters of Intent and Memoranda of Understanding into complex legal documentation. Our experience has extended across the whole range of legal inputs involved for major resources and power projects. These have included the Lead Counsel role in the negotiation and documentation of project ownership structures, the key supply contracts, the engineering and construction contracts for infrastructure development, the off-take contracts to underpin the project financing, and the Australian and State Government approvals including the State agreements. Mr Chambers’ own background as General Counsel of CRA Ltd (now Rio Tinto Ltd) over a 14 year period involved all aspects of the iron ore industry development and operations in Western Australia over many years while he was still at CRA, and in particular for Hamersley Iron. That involvement has continued in subsequent years on other iron ore mining and processing projects. In October 1984 our firm was engaged by China Metallurgical Import and Export Corporation established under the Ministry of Metallurgical Industry (now Sinosteel Corporation) as its lead lawyers on the negotiations of the AUD420 million Channar Iron Ore project in Western Australia. That project was China’s first major offshore investment and was regarded as the “model” foreign joint venture structure for China. 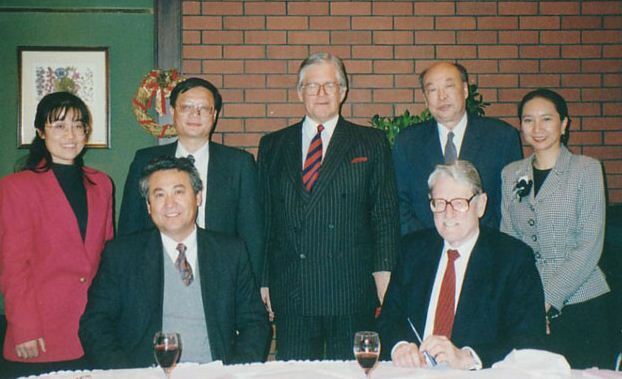 It attracted very high level attention from both the Chinese and Australian Governments and involved the personal participation of the Chinese Premier Mr Zhao Zijiang and the Australian Prime Minister, Mr Bob Hawke on certain issues which arose during the negotiations. The Chinese Government referred to Mr Chambers as the first foreign lawyer appointed by the Chinese Government when the firm was engaged for that project. 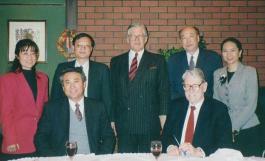 In 1993 we were engaged by Shougang (Capital Iron & Steel) to undertake negotiations with BHP Limited to do an iron ore joint venture in Western Australia following the precedent of the Channar Joint Venture with Hamersley. Those negotiations continued for many months before they were terminated and Shougang instead invested in a Peru iron ore project. In the mid 1990’s, we were the lead legal counsel appointed by Australian United Steel Industry Pty Ltd on its AUD2 billion direct reduced iron (“DRI“) project to be developed in Western Australia using Hamersley iron ore and natural gas from the North West Shelf consortium. Our involvement for that project extended over a three year period, and covered every aspect of the project development. That included all the due diligence investigations, the project joint venture documentation, the engineering and procurement contracts, the iron ore and gas supply contracts, the DRI off-take sales contracts with China, Taiwan, South Korea and Indonesia, and all the approvals required by the project lenders. The financial advisers for that project were the Australian Macquarie Bank and Merrill Lynch of New York. That project failed due to the Asian financial crisis in 1997. Before that happened, the project had attracted strong interest from China for a major equity investment as well as guaranteed off-take purchase contracts for the Chinese steel industry. China Iron & Steel Industry & Trade Group Corporation, which was the corporatised entity under the Ministry of Metallurgical Industry (now Sinosteel Corporation), was joined by Shanghai Baosteel together with COSCO as the Chinese participants. The Chinese Premier, Mr Zhu Rongji, signed a protocol during his visit to Australia in support of that project with the Australian Prime Minister, Mr John Howard during the project negotiations. After that project development ceased, we advised the Mt Gibson syndicate, which was developing another smaller DRI project in Western Australia, on obtaining Chinese equity investment and markets and introduced them to potential investors in China. While not an iron ore project, this was another landmark WA-based project for our law firm. Mr Chambers was the Lead Lawyer on the Argyle Diamond Project, from the initial listing of the commercial and legal structures as 10 points on a blank sheet of paper through to the complex project negotiations and documentation, the negotiation of the State Agreement with the WA Government, the precedent- establishing sales contracts with De Beers’ Central Selling Organisation in London including face to face meetings with Harry Oppenheimer in Johannesburg to break the CSO’s monopoly on the diamond retailing business, and the project financing of this project with the international banking syndicate. In the late 1990’s, following a mandate from the Tangshan Municipal Government, we acted for North Limited on a potential investment in the Tangshan Port Project. North’s role was to be the foreign partner for the port development in a joint venture with the resulting tax incentives then available for the project. In return major Chinese steel mills such as Capital Iron and Steel would guarantee iron ore sales into China for at least 5 million tonnes, which was a considerable increase over its sales of around 2 million tonnes previously. These negotiations were well advanced when Rio Tinto initiated its takeover of North Limited. We had advised AuIron Energy Limited on its AUD1.2 billion SASE Pig Iron Project in South Australia which was focused on the Chinese steel industry as its major market. The leading edge technology for that project was a direct smelting process developed by Ausmelt Limited, an Australian technology company based in Melbourne. This is competitive technology with Hamersley’s HIsmelt technology (Ausmelt has built six non-ferrous smelters in China using its non-ferrous technology) Mr Chambers was Chairman of Ausmelt for some time. Our involvement on this project extended over a three year period and included negotiations with a number of Chinese steel mills for their participation in the project. The South Australian and Australian governments provided development grants for this project. 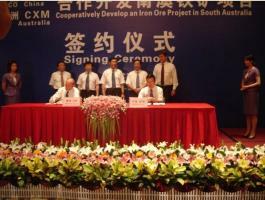 The Wheelarra iron ore joint venture was the largest iron ore project undertaken by the Chinese government in Australia which involves four of China’s leading steel mills major investment in the Wheelarra project, entering into off-take iron ore contracts for 12 million tonnes a year over a 25 year period worth more than AU$11.6 billion in exports (under subsequent sales contracts, the annual sales were increased to 24 million tonnes). Taken together with our firm’s role in the Channar Joint Venture, we have been responsible for iron ore export contracts to China well in excess of AUD20 billion from Australia. We were appointed originally by Wuhan Iron and Steel (Group) Corporation Ltd and Tangshan Iron and Steel Co Ltd, and later joined by Maanshan Iron and Steel Company Limited and Jiangsu Shagang Group Co Ltd as the lead lawyers for the Chinese participants in their project with BHP Billiton. To do so, we had to beat all the large Australian law firms for this representation, just as we did for the Channar iron ore project. The Wheelarra project legal documentation was finally executed in Perth on 28 September 2004 by all four Chinese Steel Mills, together with BHP Billiton and tw­o Japanese trading houses. The documentation comprised 181 agreements signed on that day. These included a complex joint venture agreement, a management agreement, a sub lease agreement to avoid amending BHP Billiton’s relevant State Agreement, for sales contracts with the Mt Newman project for the Jimblebar iron ore for blending purposes for Mt Newman, equipment usage agreements, off-take export contracts on a CFR basis so that BHP Billiton can control the shipping, and other documentation to entrench the returns on the capital investments made by the Chinese participants since the equity payments were made direct to BHP Billiton and not for mine development. These negotiations with BHP Billiton extended essentially full-time over more than six months of internal meetings and face-to-face negotiations scheduled with BHP Billiton in China and Australia. After initially negotiating and documenting Letters of Intent for the Chinese Steel Mills, we undertook a comprehensive due diligence investigation on behalf of the four Chinese Steel Mills as BHP Billiton declined to provide any legal representations to the Chinese on the underlying aspects of the project. This involved the traditional data room period for the preparation of a detailed report comprising at least 150 pages on all aspects of the project. This was followed by further negotiations with the WA and Australian governments for all relevant approvals and consents under the WA State Agreement, other WA legislative requirements, Foreign Investment Review Board and Australian Competition and Consumer Commission approvals. All documentation and communications were in the English and Chinese languages and on a real time basis. While we were required to advise on all the Australian and Chinese legal aspects of the transaction, with our expertise and experience on similar major projects we were often called upon to provide more than strict legal advice to assist the Chinese negotiators who had not previously had experience on major international projects of this kind. We have been accustomed to doing this on similar transactions on many occasions. This project commenced operations in October 2005. We were briefed by Wuhan to undertake a comprehensive due diligence investigation of the proposed magnetite project with Mineralogy in 2005. This project was to be developed in a three stage process beginning with a concentrate production and extending to direct reduced iron and pellet projects. In addition to the due diligence investigation, we undertook a review of the proposed legal documentation and the structuring arrangements for this project. Wuhan ultimately did not proceed with the project and, instead, CITIC Pacific entered into the necessary arrangements to develop this project. We acted for a major European steel producer to undertake the preparation of a comprehensive due diligence investigation on this proposed project. Over a number of months we were involved in a review of all the legal documentation prepared by the vendor. This was a competitive tender process which extended over some months as our client negotiated the tender with Hancock Resources, the owner of the project. Ultimately, the project was done by Rio Tinto. This is one of the largest new iron ore projects in Australia involving a total investment of around AU$3 billion comprising a mine development initially to produce 45 million tonnes of iron ore over a 25 year period, together with infrastructure development to construct a 260 km railway and new port and processing facilities. We acted as the legal adviser for our client, which is the largest steel producer in the world, on these project negotiations. Over a nine month period during 2005, following extensive due diligence investigations, we prepared all the key joint venture documentation comprising six major agreements and many hundreds of pages of documentation for our client’s participation in the proposed unincorporated joint venture. Negotiations took place in Singapore, Paris and Perth over that period. Ultimately our client did not proceed with this project and FMG financed it in the US bond market. In July 2005, we were instructed by Sinosteel Corporation as its lead lawyers to document and negotiate a joint venture with Midwest Corporation Limited for the undertaking of three stages of scoping, pre-feasibility and bankable feasibility studies on its proposed Koolanooka and Weld Range Iron Ore Projects and related infrastructure facilities and port and rail facilities. 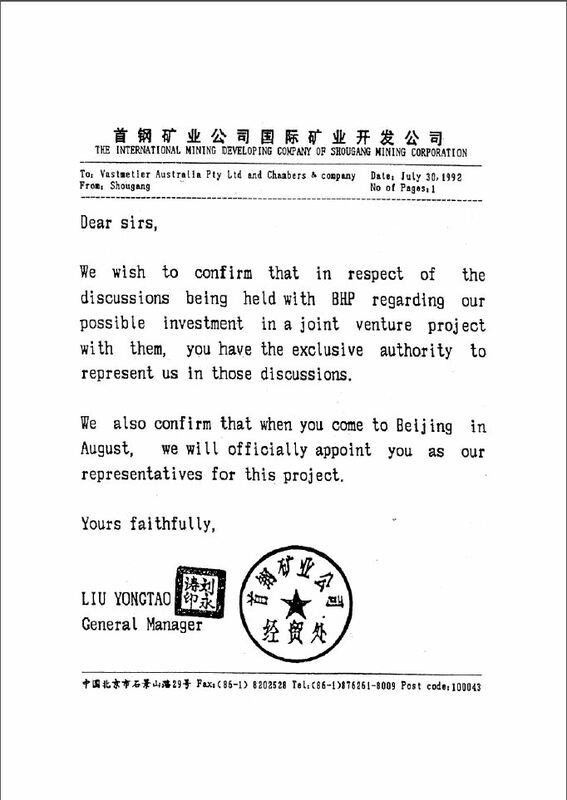 Over a period of three months involving eight negotiating sessions in Beijing, Hong Kong and Perth, documentation was finalised and signed in Perth on 18 October 2005. In March 2005 we were engaged by Gindalbie Metals Limited as its legal adviser to negotiate and document a Feasibility Studies Joint Venture in connection with the proposed Mt Karara Concentrate-Pellet Project, the Blue Hills Haematite Project and the associated infrastructure projects in Western Australia in conjunction with Anshan Iron & Steel Group Corporation. The signing ceremony for the legal documentation was held in Parliament House, Canberra during Chinese Premier Wen Jiabao’s visit to Australia in April 2006. During 2007, we were engaged by Aurox Resources Limited on its proposed vanadium and titanomagnetite joint venture with Chengde Iron & Steel Group Co Ltd in Western Australia. As the initial stage on this project, we drafted the Heads of Agreement setting out the broad principles to be agreed for this project. Most recently, we have drafted the long term sale contract to underpin the project. Subsequently, Chengde entered into a long-term sales contract in lieu of joint venture participation. We also advised on a further long-term sales contract for another Chinese steel mill RockCheck (Panzhihua). The combined off-take sales for these two contracts are for a total of 6 million tonnes per annum. We were engaged by FerrAus on its proposed new iron ore project located near BHP’s Wheelara projects mine to provide advice on third party access rights to existing rail information in the Pilbara region of Western Australia. Under the state agreement entered into between BHP Rio Tinto and Fortescue Metals obligations exist to require these mining companies to open up the rail facilities to access by other mining companies. FerrAus has its new mine located near Jimblebar Mine which is held in a joint venture between BHP and four of China’s major steel mills. We are the lawyers for the Chinese steel mills on that joint venture. The third party access issues have been the subject of considerable litigation with BHP Rio and Fortescue and most recently the Australian High Court decided that BHP’s rail operations were not part of the mining process and accordingly were available for third party access. However, the nature and extent of the third party access is still to be resolved. 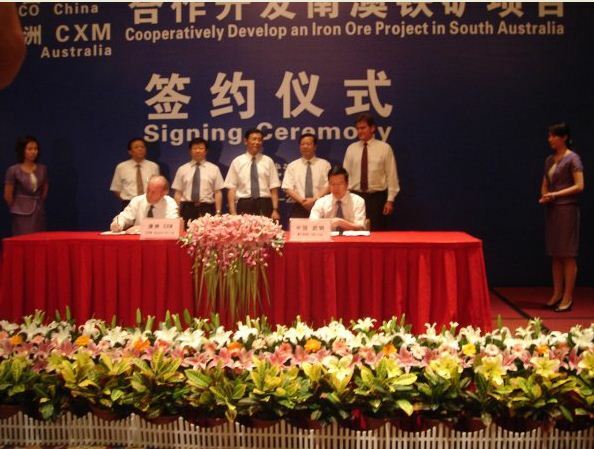 In connection with another new Australian iron ore project, advised the State Development Bank of China (the “Bank“) in connection with a proposed loan of approximately US$14 million to be secured over shares in an Australian company listed on the Australian Stock Exchange partly owned by a major Chinese steel mill. Our advice included investigation and assessment of the validity of the initial acquisition of the shares in the Australian company, dealing with Foreign Investment Review Board approvals with regard to the proposed charge and, investigating issues relating to restrictions on dealing with the shares imposed by the initial share subscription agreement. We were the lawyers for WISCO on its joint venture with Sydney based Western Plains Resources Limited (“WPG“) with regard to a 50/50 joint venture to complete a feasibility study and, if the study proves positive, development of one or more of the magnetite deposits located in WPG’s Hawks Nest tenements south of Coober Pedy in South Australia. WISCO will “sole fund” a minimum commitment of AUD25 million to earn a 50% participating interest in the joint venture and also subscribe for approximately 12.1 million shares in WPG for a sum of approximately AUD3 million. We assisted WISCO with the negotiation and agreement of the various transaction documents relating to the joint venture and share subscription attending negotiations in both Australia and China. Again this followed comprehensive due diligence into the potential investment and extensive negotiations of binding Heads of Agreement to establish the commercial terms for the Chinese investment. We advised WISCO on its joint venture with Adelaide based Centrex Metals Limited (“Centrex“) relating to development of Centrex’s magnetite prospects located near to Port Lincoln in South Australia. WISCO will pay Centrex a total of up to AUD186 million for 60% equity in the joint venture and also subscribe for just over 40 million shares in Centrex for a sum of approximately AUD10 million. We assisted WISCO with the negotiation and agreement of Joint Venture Agreement, Farmin Agreement, Share Subscription Agreement, Shareholder Agreement and Management Agreement, with negotiations in both Australia and China. This followed comprehensive due diligence into the potential investment and extensive negotiations of binding Heads of Agreement to establish the commercial terms for the Chinese investment. We advised Oakajee Port and Rail Pty Ltd (“OPR“) on certain aspects of the AUD4 billion Oakajee Port and Rail development in the mid west region of Western Australia. The Oakajee deep water port and integrated rail network will deliver an integrated region to customers in the Asia Pacific region. 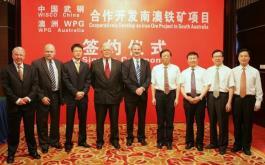 On 20 March 2009, OPR and the Western Australian State Government signed an exclusive State Development Agreement for the development of the project and welcomed Chinese contractors to participate in the capital works associated with the possibility of obtaining financing from Chinese banks to fund the Project. The State and Federal Governments will provide funding of AUD678 million for the construction of the common use port infrastructure. On 3 December 2010, Rio Tinto Limited and Sinosteel Corporation executed the agreements for the extension of the Channar Joint Venture in the Pilbara region of Western Australia leading the way for a further 50 million tonnes of iron ore to be produced under this ground breaking joint venture. The signing ceremony took place at the Diaoyutai State Guest House in Beijing. Senior Chinese Government officials and senior executives from Rio Tinto and Sinosteel, and the Australia Ambassador to China attended the ceremony. The negotiations for the Channar extension commenced in December 2004 triggered by the relevant provisions of the original Channar Joint Venture Agreement. Negotiations continued over the ensuing years and the Heads of Agreement was executed on 14 October 2010 which set out the basic terms of the extension. The voluminous documentation for the extension comprising some hundreds of pages was finally executed on 3 December 2010 after extensive negotiations in Perth, Beijing, Shanghai and Singapore. 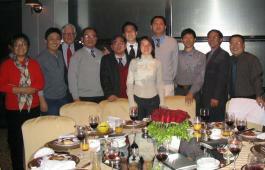 Our law firm represented Sinosteel in the negotiations. Our team was lead by Mr Robin Chambers AO and Mr Angus Macdonald. Sinosteel’s team comprised of Mr Li Ying (President of Sinosteel Australia Pty Ltd) and his colleagues, Mr Ian Holding, Mr David Sun and Mr Gavin Woodward. Rio Tinto and Sinosteel, the two foundation partners of the pioneering Channar joint venture, have celebrated the milestone shipment of the 200 millionth tonne of iron ore produced under the historic agreement. The milestone was reached with the loading and departure yesterday of the Pacific Navigator with 160,000 tonnes of lump and fine ore. It is expected to discharge in China by mid-June. The Channar Joint Venture (Rio Tinto share 60%) was formed in 1987 to jointly develop the Channar iron ore mine in the Pilbara region of Western Australia, about 20 kilometres south east of Paraburdoo, with shipments commencing three years later. Channar was China’s first significant offshore investment and its success has contributed to China’s growth as a global trading, investment and industrial powerhouse. Sam Walsh, Rio Tinto Chief Executive, Iron Ore and Australia, said “reaching this milestone was particularly important given the current economic uncertainty being experienced elsewhere. It is of great significance not only for both companies, but for China and Australia. We need to remind ourselves that the Pilbara was not always the engine room of the Australian export economy, and China was not always the centre of so much global investment and trading activity as is the case today”. “The Channar joint venture was only established through the mutual trust and co-operation of the two companies, backed by strong political support from each government. Given the current global economic context, it is fitting that we remember what this spirit of co-operation and goodwill can achieve”. Mr Jia Baojun, President of Sinosteel Corporation, said “the Channar Mining Joint Venture was the first large resource project investment in Australia by China and has always been viewed as the template project between China and Australia”. “Twenty five years ago, iron ore from Australia was not well accepted by the Chinese market. It was the hard work by both JV partners that opened the door of the Chinese market for iron ore exports from Australia. Today, Australia has become the No. 1 iron ore exporting country to China. This would not have been possible without the great contribution from both partners. At this historical moment, we recognise that the original decision makers showed great foresight and wholeheartedly appreciate the excellent contribution from all the related people of both partners during the life to date of the JV and the support from all our end uses in China”. “The first shipment of iron ore from the extension term of the Channar Mining joint venture is opening a new chapter in the co-operation between Sinosteel and Rio Tinto. Sinosteel and Rio Tinto will work together to mine another 50 million tonnes of high grade iron ore for the Chinese market. In addition, according the strategic co-operation framework agreement signed in 2010, Rio Tinto and Sinosteel will strengthen the potential co-operation in, and joint development of, iron ore opportunities within or immediately surrounding the Channar mine”.